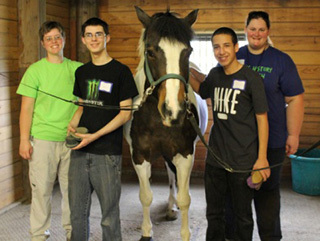 This spring through a generous grant from Kevin Ellison, 35 ninth graders from Facing History New Tech High School explored the “seven norms of collaborations” through a variety of exercises with our horses. The students left Fieldstone Farm with a greater awareness of themselves and energized to work with others. The team leader wrote, “I was blown away by the students’ willingness, creativity and courage. Thank you Fieldstone Farm. This was a wonderful experience.” Plans for next year’s participation are already underway.